Send us your design in any format, sit back and relax! 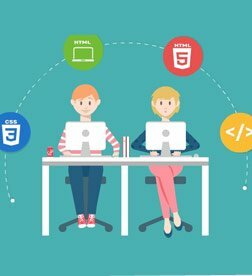 Our highly skilled HTML developers will deliver a High Quality, Pixel Perfect, Hand-coded, W3C validated, and cross-browser compatible HTML5/CSS3 or HTML/XHTML/CSS (as required) markup on-time. 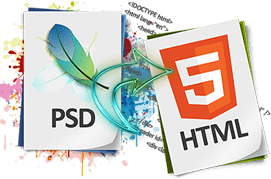 We specialize in HTML/HTML5 Conversion – our HTML developers/programmers are highly-skilled, trained and have coded thousands of pages over the years. Our team's vast experience and expertise helps us to deliver HTML sliced pages in fastest possible time. Leverage our experience - 9 Years in Business. 500+ international projects delivered. 100+ clients spread across 31 countries. Implementation of other CSS frameworks such as Neat Bourbon, Skeleton, Zurb Foundation etc. We are experts in HTML5/CSS3 Development and our quality standards are at par with international standards – HTML5/CSS3 supports latest, flexible and powerful features that enable you to create a modern, high performance website. Dedicated attention – our team will go the extra mile to make sure that high quality output is delivered. High Quality Service at an unbelievable price – our prices are among the lowest in the market and you get a premium service at this price. Fast Turnaround time – We have proven track record of delivering projects in fastest possible time/on-time. Excellent Customer Support – We are available 24*7 to handle your queries and give you updates about the progress of your project. We always go the extra mile to make our clients happy. You can get in touch with us anytime through any mode of communication – email, chat, phone or Skype. 100% Transparency – We make sure that our clients get to know everything about the project and be clear about the progress of the project at every stage. No hidden charges. No concealment of any project information. Technousa is a reputable, trust-worthy web agency that believes in honesty, fairness and quality of work. 100% Satisfaction Guarantee – We are so sure about the quality of our work that we offer 100% satisfaction guarantee. We make sure that our clients are 100% satisfied with our work. Non-disclosure Agreement – If required, we are open to sign NDA and we assure you that we will never share any of your project details with anyone without your permission. You send us your designs and explain your requirements to us. Our expert team evaluates the project and gives you the quotes. Once approved, a dedicated project manager is introduced and he/she manages the whole project execution process and keeps you in the loop throughout the process. He/she also gives valuable suggestions for your consideration. Our project manager ensures that the project output is delivered exactly as per your requirements. Sounds good? Let's get started. Hit the 'Request Project Evaluation' button below and fill the quick form. Get a no-obligatory custom quote within 1 business day. That's a guarantee!